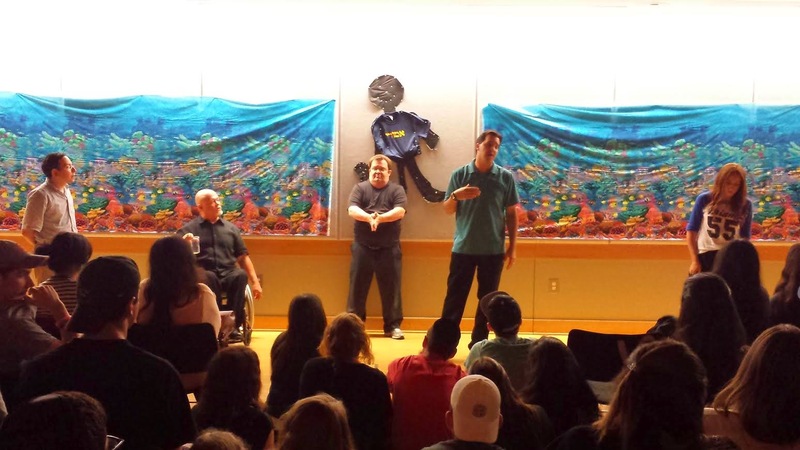 The 4th annual Evening of the Arts was a resounding success. The audience got to enjoy an eclectic mix of performing, visual, and graphic arts. (not to mention refreshments!!) This celebration of the Arts Department here at Flatbush is a wonderful opportunity for both the talented student and the equally talented-- but often less seen Arts Faculty to strut their stuff, all to the delight of the overflow audience. The musical numbers ranged from pop to standards to classical music, there were scenes from iconic Broadway plays and interpretations of original student poems, as well as an art gallery of interesting and evocative student work. Coordinated by Ms. Ruchie Winker and MCed by Ms. Shelley Kaplowitz, this was an evening Flatbush will long remembercertainly at least until the 5th Annual edition, next year. For the first time in years, the Student Senior Council finally took a stand against rainy weather for the annual Junior Day. Instead of the usual "Day in the Park" students enjoyed a surprising Grand Central Scavenger Hunt. 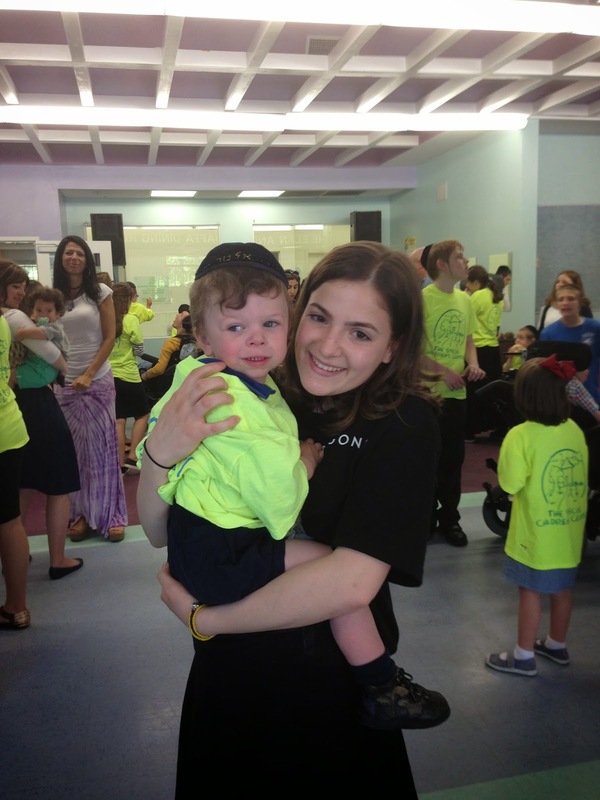 Juniors arrived to school that morning for late minyan and received customized Junior Picnic t-shirts before getting on the train to Grand Central Station. Once finally at the station each team set out to check off one zany task after the next. They took pictures with babies, police men, a disguised Mr. David Galpert, and even started flash mobs. Juniors were sent to the four corners of the station from the Whispering Hall to the Apple Store, and from the tennis courts to the Campbell Apartment. At 12noon sharp the students once again convened at the main hall and hopped back on the train where they sat back and clapped along as street performers did their thing. 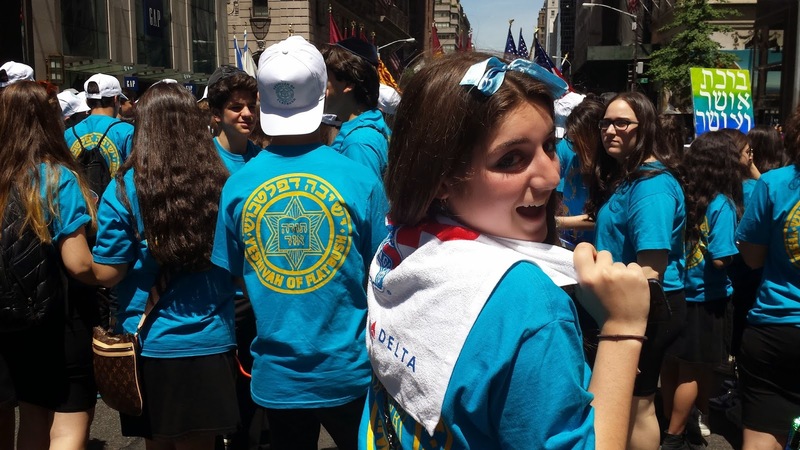 On June 1st Yeshivah of Flatbush Joel Braverman High School, as well as the Middle Division, participated in the annual Celebrate Israel Parade. This is an incredibly huge event in which more than 250 schools and institutions participate. This year, the general theme honored the 50th anniversary of the parade. As it is our tradition we made a special presentation with the sub theme "50 blessings for the State of Israel on the 50th Parade." Our preparation is always a year long journey and an educational experience.Our t-shirt is designed by our own students in the graphic design class under the supervision of Ms. T Berkowitz. The always accurate historical background as well as the beautiful psukim portrayed are chosen by Dr. L. Gerber. The preparation of our visual presentation is carried out with outstanding creativity by Mr. J. Novetsky and the students in his different art classes. Our majestic Color Guard is prepared by Mr. N. Sanders. 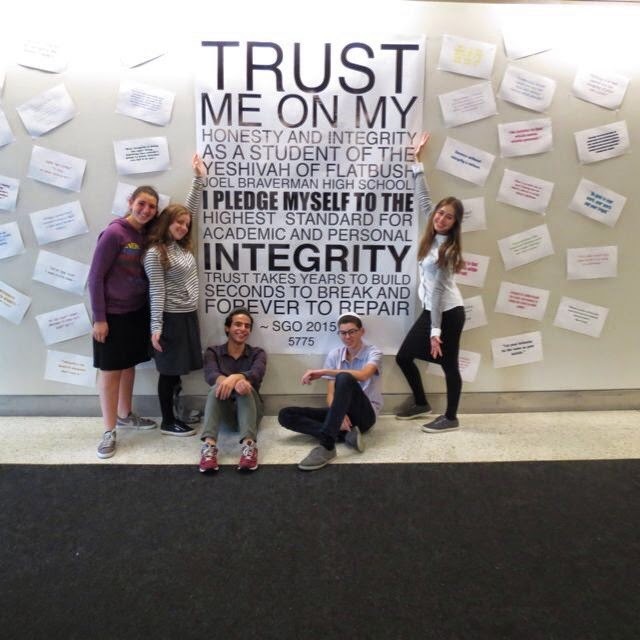 The banners with psukim are created and painted by Ms. Dvora Greenfeld. Many students are empowered to be commissioners of the different marching components from the creation of the dance for the Dance Troupe, the music that will accompany our school while marching, and more. 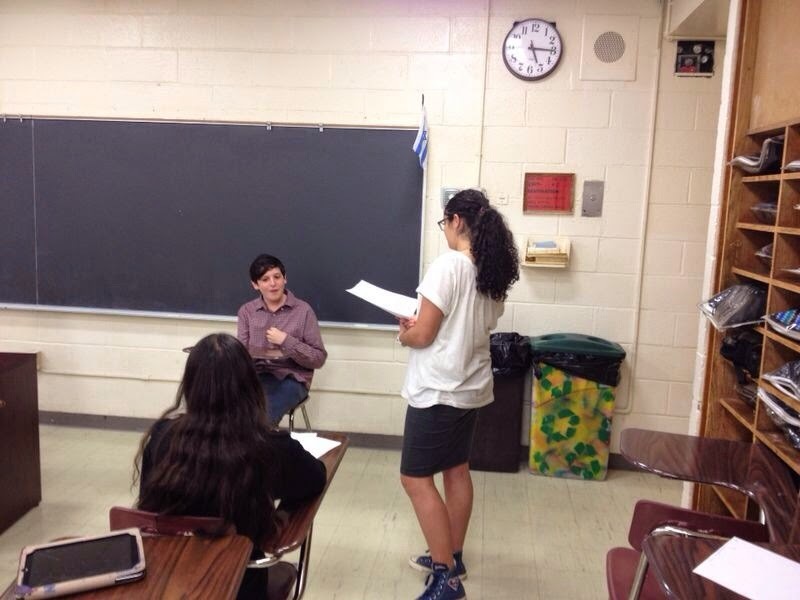 Last but not least, everything is coordinated by Ms. Elana Birman. 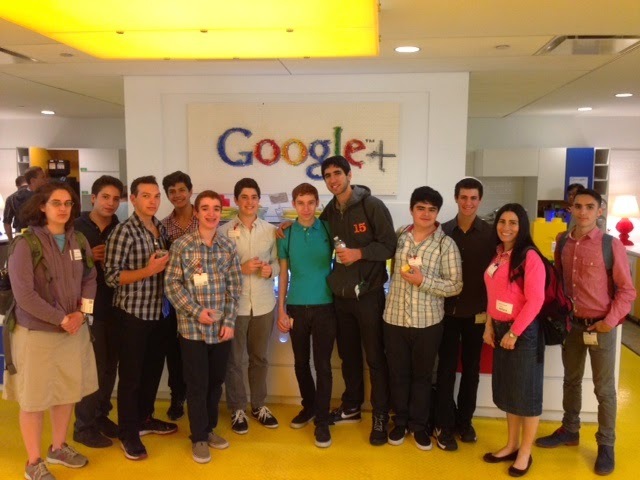 On May 22, Ms. Benun and Ms. Wernick accompanied Yeshivah of Flatbush engineering students to Google headquarters in Manhattan. After a tour of the offices and the building space (that used to be the Port Authority of New York) former Flatbush graduates who now work for Google, Ari Gilder and Jonathan Heinberg, hosted a Q & A session on educational, business, creative and personal achievements and factors that resulted in their landing jobs with one of the world’s most coveted employers. All were fortunate to have access to the professional advice of Ari and Jonathan regarding students’ future engineering projects and programming aspirations. Thank you to Ms Wernick for arranging the trip. On their last trip of the 2013-2014 school year, students part of The Traveling Troupe, sponsored by Victoria and Jack Aini, traveled to Seacrest Nursing Home, one of their favorite nursing homes. They celebrated the joy of music, dance, and drama performance with a wonderful audience of warm and eager elders and nursing home patients. The stirring performances on the trip were jovially moving for both the audience members and members of the the troupe. Congratulations to actors Michelle Harari, Merle Dweck and Danielle Ashkenazi; pianists Elaine Aini, Rachel Isayev and Leah Linfield; drummers Ikey Benzaken, Mosie Salame; violinist Evelyn Tawil; singers Michael Chakkalo, Aida Franco (who also tap danced) and Michael Zalta on sharing their talents in the an amazing act of Chesed. Special thanks to Rabbi and Mrs. Hanon for assisting with arrangements for the trip, Henny Shterenzer for accompanying the troupe, and to Michael Catton (travel troupe guitarist) and Joey Baum who took pictures and videos. The Yeshivah of Flatbush had the honor of hosting the Chief Rabbi of Israel, Rishon Letzion Harav Maran Yitzchak Yosef. With cameras flashing and security watching, the renowned rabbi spoke about achdut and keeping up our yahdut. His speech, which was all in Hebrew, was about the connection that the luchot had from ben adam lechavero and ben adam lamakom, and how the structure of the kelim resembled its importance. He then connected that to us, the students of Yeshivah of Flatbush, in how our structure as Jews and our personalities within our neshamot resemble our duty in this world to continue along the path of a good Jew while holding on to the beneficial force of the Torah. He moved and inspired us all as one united group, and even threw a few jokes here and there. 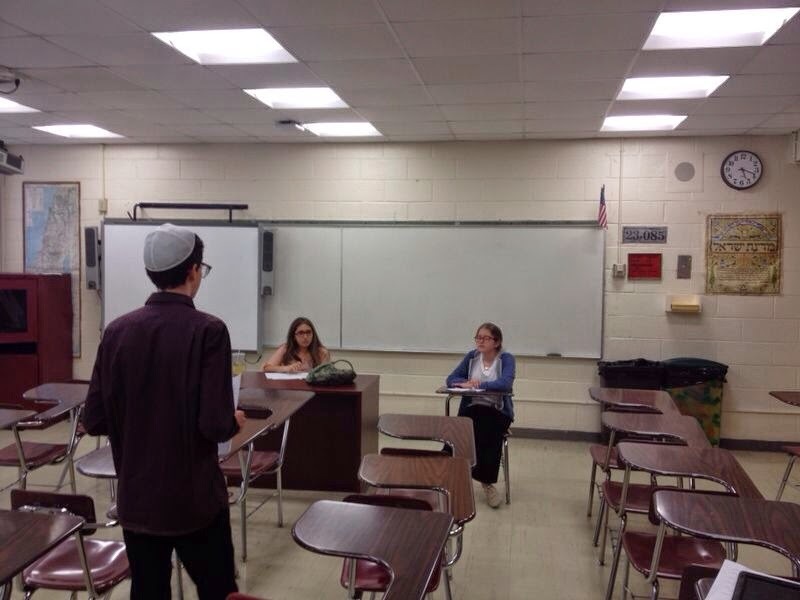 Giving a speech to the Yeshivah strengthened its standard as well as brought it to a higher level of spirituality. We hope that every student learns a lesson from that motivational speech, and that we should merit to see Maran Yitzchak Yosef another time in our school. On Friday, May 30th Yeshivah of Flatbush Joel Braverman High School honored students for their academic excellence in the annual Arista: National Honors Society Induction Exercises. The Arista program is a great way for us to recognize the hard work and effort our students put in over their years of high school to succeed academically. We are on the same coach bus that we have been sitting on since 6:30am Thursday morning. All that I can say is that we are all tired from sitting all day/ night. Being on this bus for 12+ hours definitely created some great memories though; between taking pictures in each state that we pass, having relay races at each pit stop, and sharing the little electronics that have not died yet and breaking out into our last kumzitz as a grade. So how exactly did we get to this point? It all started yesterday, Thursday, at 6:00am. We woke up and headed for whitewater rafting in Tennessee. It was pouring rain and we were all dreading going out on the river. However, once we got to the river side the rain stopped and the sun began to shine. 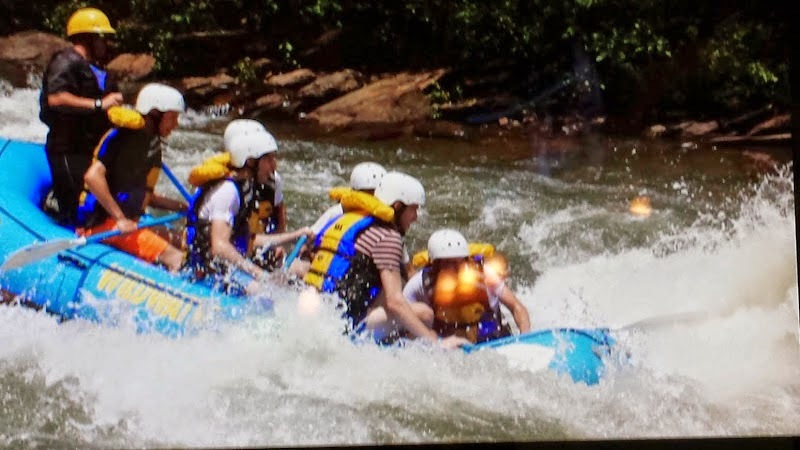 The experience whitewater rafting was so amazing! It was probably one of the best parts of our senior trip. Once all of us showered and dried off, we were expecting to go back to Atlanta for a late lunch and the head straight for the airport. They say when we plan, G-d laughs. Hashem certainly had other plans for us. One of our two flights home were canceled. 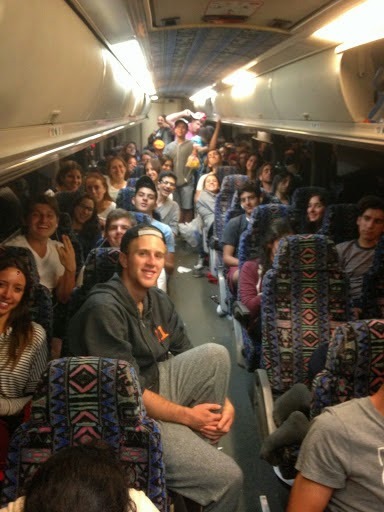 The flight that was not canceled flew back to New York with more than 30 students and faculty. The canceled flight with 100 students and faculty had to find another back to New York to make it in time for Shabbat and graduation on Sunday. We decided that the fastest route home would be to drive from Atlanta to New York. We stopped by a supermarket, bought a bunch of food for our road trip and headed back for Brooklyn. So now you all know how we got to this point on a random highway in Virginia. Even though our trip took some unexpected turns it was truly an unforgettable experience that we will remember for the rest of our lives. Today was an amazing, fun-filled day. 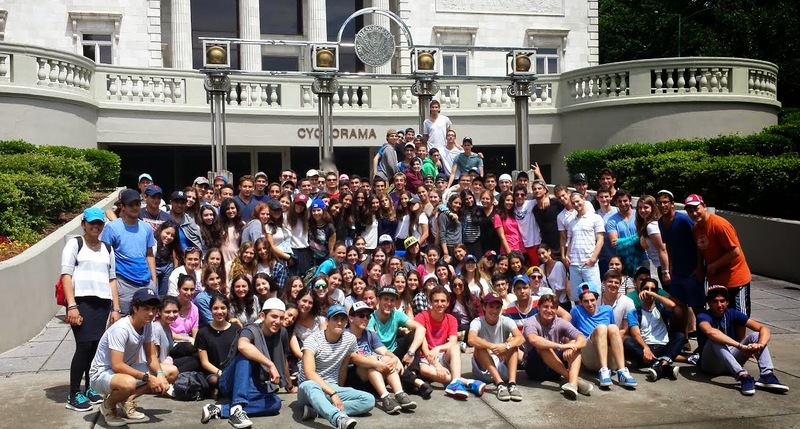 This was the second day of the Yeshivah of Flatbush 2014 Senior Trip in Atlanta, GA. We woke up refreshed and energized to start a jam-packed day. After having minyan and a delicious breakfast, we embarked on our journey to Six Flags. There, we all split up into small groups and ventured through the park. The risk-takers and adrenaline junkies had a blast by going on insane roller coasters such as, "The Daredevil," “Goliath," "Batman," and many other thrillers. But whether or not one enjoyed the high-speed rides, everyone managed to have a fantastic time. Some seniors even managed to walk out with life size stuffed animals in their hands! Afterwards, we had a quick lunch outside the park and managed to finish only seconds before a downpour of rain. 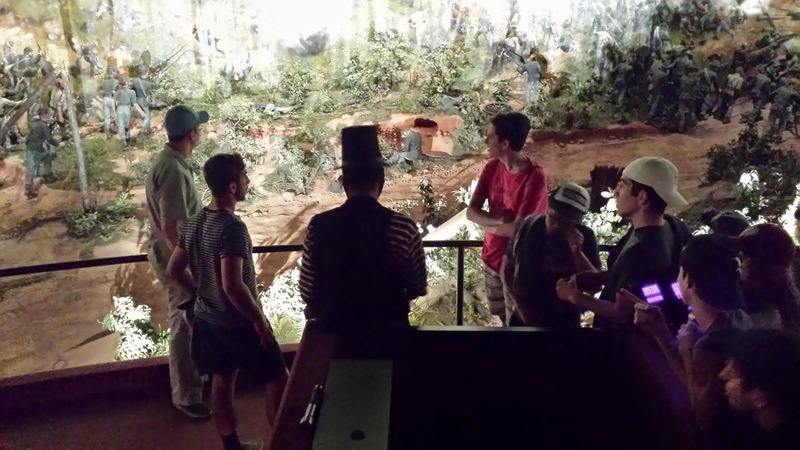 Our next stop was Atlanta Cyclorama, a Civil War museum exploring the Battle of Atlanta. We were able to gain a healthy dose of education by checking out the museum and listening to our very informative tour guide, “Young Abe". We were able to “ride” on the Cyclorama itself which was an enormous, 360 degree painting that depicts the historic battle that took place in Atlanta. The Cyclorama would slowly rotate in order to reveal the entire painting to us. After the Cyclorama, we went to Congregation Beth Jacob for Mincha and Aravit. In the break between prayers, we had the honor of listening to Rabbi Chaim Neiditch, director of Atlanta NCSY. He spoke about staying Jewish in the "real world" after high school. 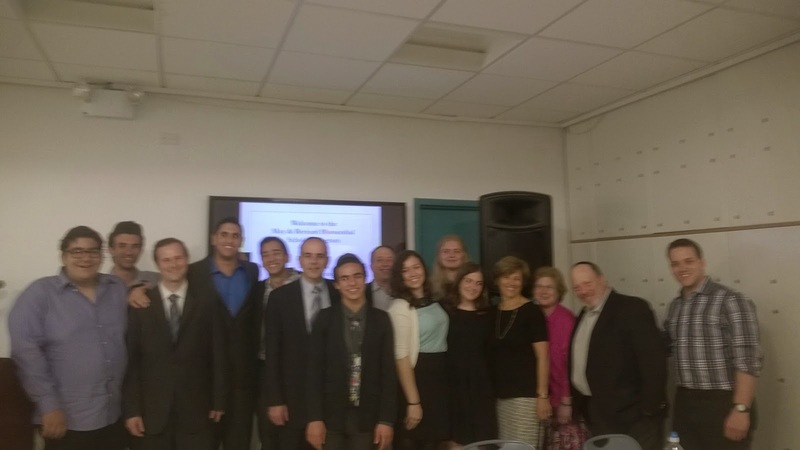 On Wednesday, May 21, 2014 / 20 Iyar 5774, the annual dinner was held to celebrate the achievements of our students in the latest cohort.of the May & Bernard Blumenthal Scholars Program. Seven elite participants presented the research papers and projects on which they had been working throughout the year, spanning the topics of science, math, writing, art and business, culminating in this inspiring and enjoyable evening. Dinner guests included the students' family members, the high school administration, faculty members, student mentors and members of the Blumenthal family, who have sponsored and dedicated the program in memory of their parents and grandparents, May and Bernard Blumenthal, a"h. The dinner program, organized by Mrs. Shifra Hanon, was spectacular and the evening offered a wonderful opportunity for students to showcase their unique talents, interests and creativity. The program coordinator is Mr. Brian Katz. We look forward to future manifestations of this successful program. Our first day of the Yeshivah of Flatbush 2014 Senior Trip started with a bright and early wake up to meet at LaGuardia Airport at 4AM. Although we were all half sleeping we arrived at the airport with enthusiasm and excitement for our flight. After going through security we prayed together and then headed straight onto the plane. Two hours later we arrived in Atlanta, Georgia. Our first stop in Atlanta was a scavenger hunt in Centennial Olympic Park . We split up into teams to compete against each other. The scavenger hunt was very organized and a lot of fun. We had to do things like find the world headquarters of CNN building, which is also in the same area (and answer trivia questions about it). We also had to get into the Coca-Cola factory and do some taste tests. 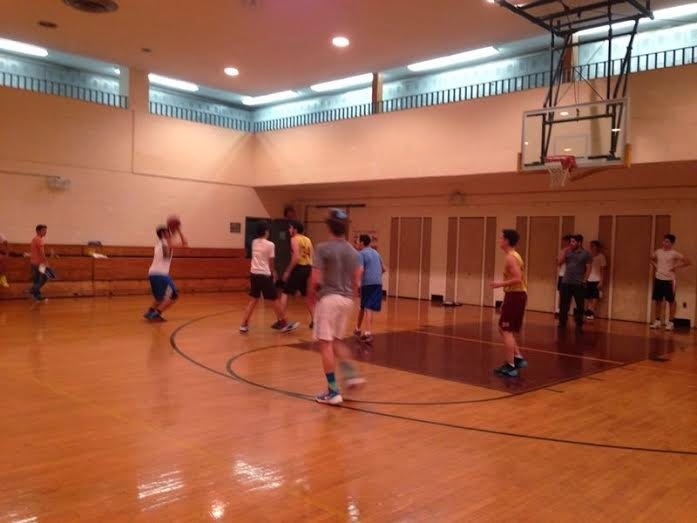 Although it was very close, team #15 (Ezra Idy, Jack Terzi, Ben Fried, Moe Chabot, Emily Apterbach, Joy Feinberg and Kalya Meshulam) won. Following the scavenger hunt we all gathered under the pavilion to eat lunch. Next, we headed to Treetop Quest Ropes Course we were tested both physically and mentally. We were split into three groups and experienced all of the three activities available. One site was high up in the air with many different obstacles all above a safety net. Obstacles like a tight rope, walking on logs, taking a small zipline and so much more. This site was very action packed and we all left with grins from ear to ear after the huge slide down. At another site, we tested our physical strengths by completing an intense ropes course in the trees. This was our chance to put all what we have learned in the previous site to the test. This site was much more challenging and we had to learn how to finagle our "tweezels" to make sure we were secure. We were all harnessed and taught about the safety rules and after the practices, we each needed to choose what level we thought we were are able to handle. Everyone had a great time no matter what level they chose. The third site, was all about teamwork. We each had to work on trust skills and work together to accomplish larger tasks. We then enjoyed cookies, chips and water. We ate, socialized and prayed Mincha there. After the rope courses, we headed to dinner at the Marcus Hillel Center at Emory University. We were served chicken, beef, salad, vegetables, and more. One can feel the cozy atmosphere, which the Jewish students at Emory University enjoy with couches, a pool table, a basketball arcade. We hung out there for a while and everyone relaxed for a bit. Senior Event. Senior Dinner. Senior Dessert.... What ever you chose to call it, it was certainly one of the best nights of our high school career in which we celebrated our four years at Yeshivah of Flatbush Joel Braverman High School. The night started off with a few great speeches from Rabbi Beyda, Mr. Galpert, Senior Council, and Sammy Tbeile. 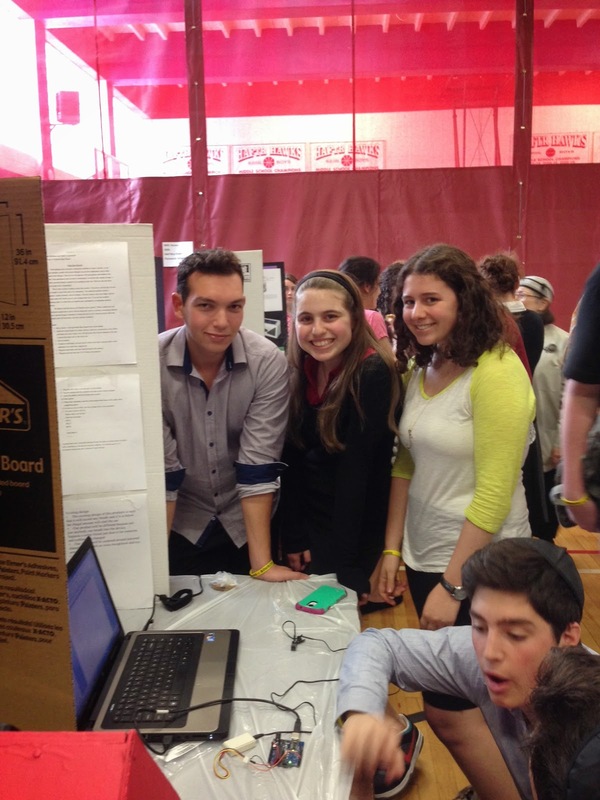 After that, Victor Dweck and Chana Sitt presented their presentations, which they created for this special night. This included hysterical videos of "Frozen" and "Do you Want to Build a Snowman" Flatbush style and "What Flatbush Seniors Say." They then presented the Farcon and Farista awards to those who deserved them. These hysterical presentations made us all feel lighthearted and happy. Gathering in the new YOFHS auditorium, the many student-athletes of Yeshivah of Flatbush who took to the field, court or track as Flatbush Falcons and their coaches celebrated the successes and reflected on the experiences of the 2013-14 fall and spring athletic seasons. With first-year Athletic Director Eric Amkraut guiding the evening, each of the 23 competitive athletic programs fielded by the school presented their roster and their individual team award winners. Mr. Amkraut opened the evening highlighting the many successes of the season, with a particular focus on the various occasions where our athletes stepped out of their competitive “comfort zones.” Starting with the Girls basketball team’s taking on a club team from Westbury, Long Island to the Boys Basketball Team taking on some of the nation’s best Yeshiva programs in tournament competition in Memphis, TN to the Baseball team doing the same for the first time ever in similar competition in Columbus, OH, our student-athletes expanded both their competitive and communal horizons. They grew immensely both in a humanistic way and athletically from the experiences. The Flatbush coaches presented awards to their Most Outstanding Player and their Most Improved Player, as well as a Coach’s Award and a Sportsmanship Award for each team. Additionally, each team captain was recognized for their leadership efforts with a special Captain’s Award. During each individual team presentation, a photo montage from that team scrolled on the video screens in the auditorium, highlighting many of the top performances of the players. The program culminated with the awarding of the Most Outstanding Male and Most Outstanding Female Senior Student-Athlete awards. It was a difficult decision, with a number of qualified candidates amongst the boys and the girls who excelled in multiple sports over their four-year careers at Flatbush. In the end, the awards went to two players who not only were excellent performers, but also were great leaders, individuals who motivated their teammates to work together as a team, to continue to strive when the outlook looked bleak, to rise to the top in the most challenging of situations. This year’s winners were Alison Kassin for the girls, and Joey Dayon for the boys. It was a great evening of reflection and celebration, wishing good luck to the graduating senior student-athletes as they move on, and a look forward for the returning student-athletes who will again wear the maroon and gold for Flatbush and strive to “Rock the Nest” in 2014-15. GO FALCONS! A special thank you goes to Senior Student-Athlete Victor Dweck and his “bucket list.” Through his goal of attending at least one event of each athletic team fielded by the school, and taking pictures at many of those contests, we were able to display pictures from each team in competition. Thank you also to Victor for putting together the team photo montages that ran during each team’s presentation. Kol HaKavod, Victor! On May 14th, the Senior grade organized a bake sale to raise money for their senior trip. 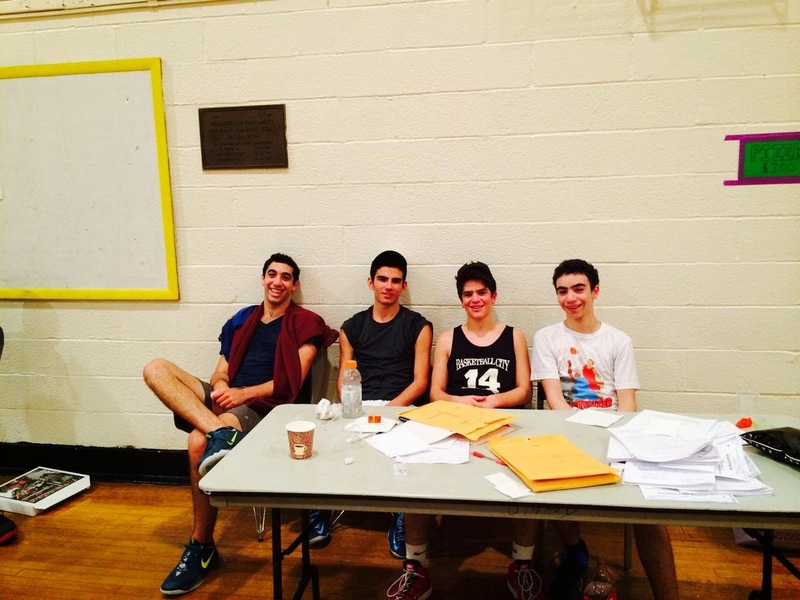 The bake sale was held at the home of seniors, Michael and Nathan Haddad. This bake sale was special in that almost every student got involved in some way to help out. Some baked, some worked, and some just hung out at the house all day. Even teachers brought their home made goods to support the event. At the same time, seniors also participated in producing their time capsule. One by one, students got interviewed on video. The questions were tough, but necessary for the future. The bake sale was definitely a success. Now, we all can't wait for our senior trip to come! Thank you to Celia Tawil for organizing the event. This past Sunday, Flatbush athletes did more than just Celebrate Israel in marching up 5th Avenue with their teachers and their fellow students. Before the parade, they took to the road and afterwards they took to the field. And with support and fanfare all around, the Falcon student-athletes had a fantastic day from start to finish! 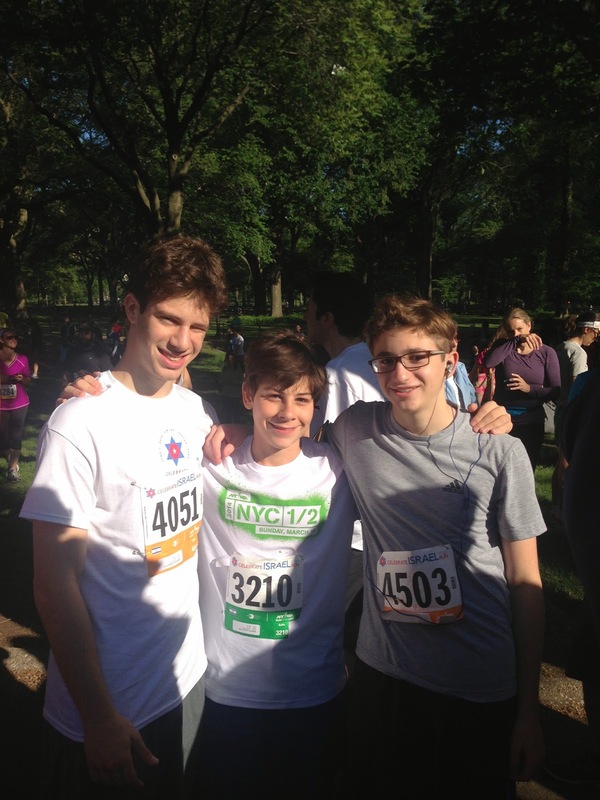 Getting an early start to this Celebration Sunday, four members of the Flatbush Track team and their coach represented the school in the pre-parade Celebrate Israel Run in Central Park. Jack Sasson finished the 4-mile course in 29:00.00, right at his target pace (if not for the racer in front of him stopping right at the finish line, he would have easily been under his benchmark time). Coach Miriam Wielgus finished in the top ¼ of female runners in her age group; a very impressive showing indeed! Also running from Flatbush were Joe Balasiano, Michael Elkharrat and Elliot Levy. Of the experience Levy remarked, “it was really a lot of fun!” All made it to the marshalling area well in advance of Flatbush’s start-off time, and all still exuded energy as they joined along with their classmates and teachers in this 50th edition of the NYC parade in support of the State of Israel. After the parade, the Flatbush Varsity Baseball team was hoping for a celebration of another kind, that of victory on the ball field. 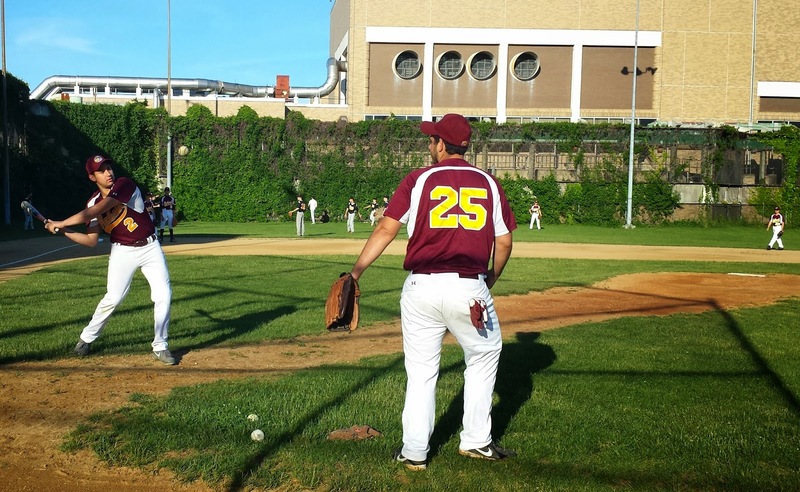 In addition to the parade, Sunday marked the opening day of the MYHSAL Baseball Playoffs. Finishing the regular season with the 3-seed, the Falcons earned a home re-match with the SAR Sting. It would be a rubber match for the two teams, having split the regular season series with each team taking a 1-0 win on the others’ home field. In both of those contests, the Falcons just could not get the bats working. But, that was before Columbus; before the Falcons found their hitting groove. Before the Falcons were playing games before large crowds. And in keeping with the celebratory mode of the day, the Flatbush faithful were out in force, filling the stands to overflowing at Comer Field. The question: which team would show up – pre-Columbus that couldn’t hit worth a lick or post-Columbus that has been knocking the cover off the ball? 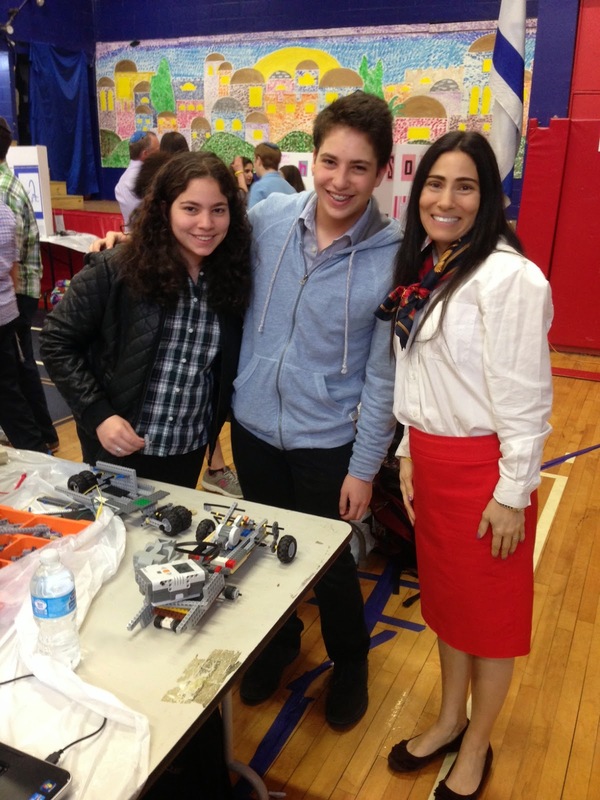 Yeshivah of Flatbush Joel Braverman High School held its annual Archon Induction Exercises on May 23, 2014 to honor students who have dedicated their time and effort to our school and community. During the program, select students were recognized for their exemplary service to the school and were specially awarded. 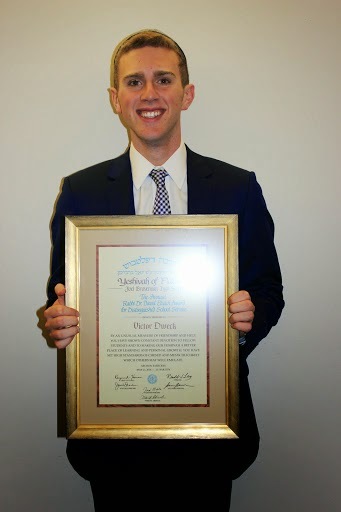 Victor Dweck received the highest honor by receiving the Rabbi Dr. David Eliach Award for Distinguished School Service and Binyamin Abramowitz received the Donna Becker Memorial Award for Peer Tutoring for his dedication to helping his fellow students academically. Mr. David Blumenthal was also recognized for his many years of commitment and dedication to our administration, faculty, and students. Mrs. Rina Zerykier was also recognized for her efforts in making Flatbush the special place that it is. Flatbush students always go above the call of duty to help their fellow students and their communities. The Archon Exercises are a great way to recognize and honor our students. A group of Yeshivah of Flatbush seniors went to Mrs. Zaltzman's house to learn how to bake Challah. They also learned about the special importance of the mitzvah of taking challah. 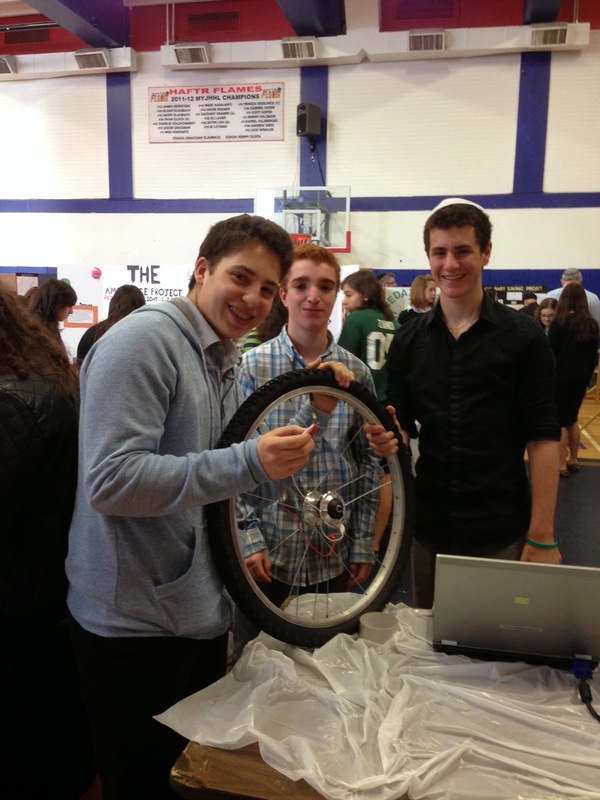 On May 21, 2014 the Yeshivah of Flatbush engineering students attended the third annual CIJE Young Engineers Conference. 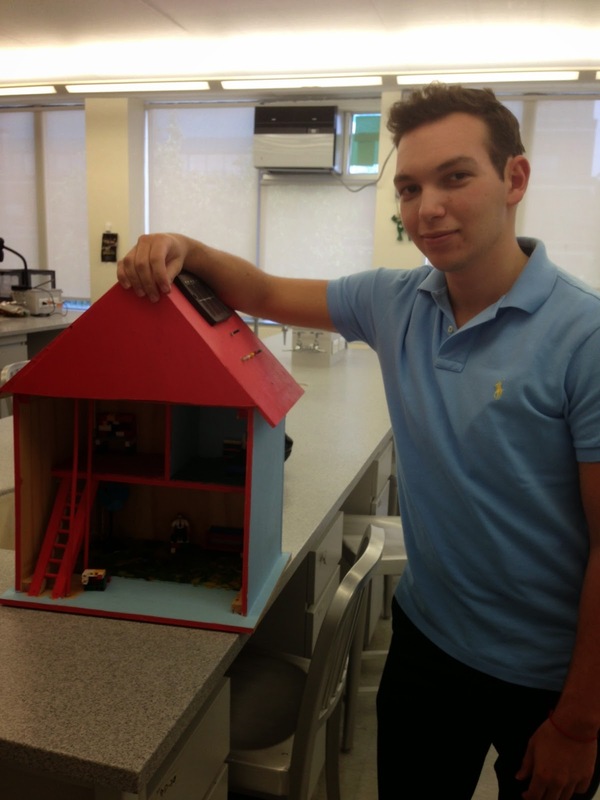 As a significant part of the CIJE-Tech Program, students are encouraged to experience creative and inventive thinking. Students integrate their skills in science, technology, engineering and math together with their creativity to invent a product that is the culmination of their journey in engineering class. Throughout the year students learned the basics of electronics, robotics, computer program and manipulation of sensors. 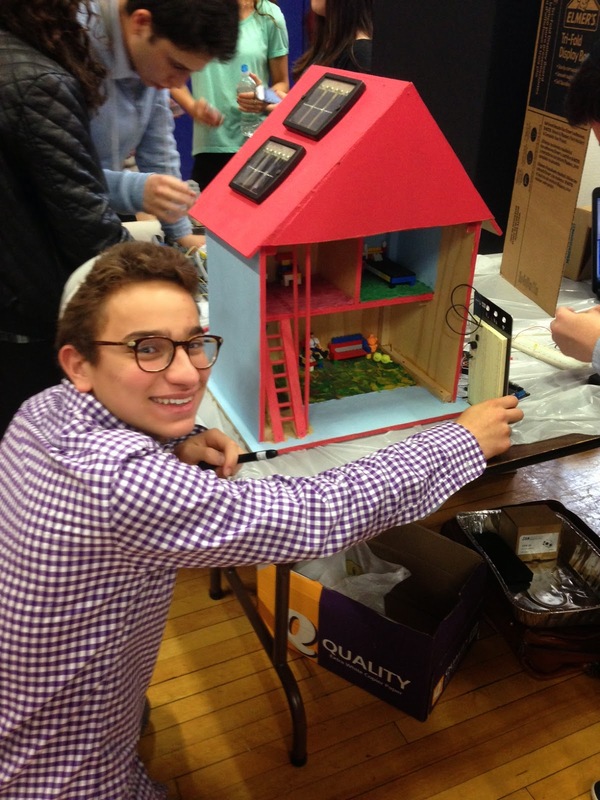 The students then took this knowledge and researched an area where they could improve upon an existing technology or develop a project that would bring about tikun olam. We are so proud of the participants who worked in school (juniors and seniors) and after school hours (sophomores) developing their engineering skills and representing our school at the engineering symposium.